There’s not much better in the summer than fresh-grown vegetables from your very own garden. After weeks of hard work planting, weeding, and watering, you have a delicious prize. However, gardens can be a cost-prohibitive way to get produce if you’re not careful. During the Great Depression and the World Wars, many households grew “Victory Gardens” to supplement their meager meals. By taking a few pages out of their book, you can grow a cost-effective garden, too! The greatest cost of growing your own garden isn’t the seeds, dirt or even fertilizer. No, the biggest cost is water. Especially if you live in an arid climate, giving your plants adequate water can cost a lot! The best way to save money watering is to simply use less. By using economical watering techniques, plants will get to use more of the water you give them. Some of these are long-term investments, while others are easier to start doing on a daily basis. Gardening can be an enjoyable leisure activity. However, that doesn’t mean you can garden whenever you feel like it, and ignore it the rest of the time. There is a best time to complete every aspect of gardening. Weeding, for example, is often best completed in the evening. Soil is driest after a day of exposure to the sun, and therefore looser. It is easier to loosen the long taproots and pull them out then. Watering should be done in the morning. At this time of day, the temperature is as low as it will get. The sun is not high enough to evaporate water away. And water will not sit on leaves to cause rust and mildew overnight. Watering is an easy task to complete in the morning, too. If you use a localized sprinkler, you can rest assured that water that lands on leaves or petals is less likely to go to waste. It has time to seep into the soil and be used by roots. Keep track of weather patterns. A simple rain gauge will do or there are more expensive weather monitoring systems. Don’t water if it has rained enough recently. About an inch of water per week provides enough moisture for strong growth in most plants. Even if it doesn’t rain much, plants can make use of the moisture in the air, too! Another awesome way to save water is to make sure it goes where it will do the most good- to the roots! If you water standing up with a hose, or use a sprinkler, much of the water you use will be lost on leaves, stalks, and surface areas. It just evaporates from here. If it gets too sunny, the plants can even get sunburnt from this sitting water. When you water your garden, place the water source as close to the roots as possible and saturate the soil. This will make sure water goes where it can be used. Thoroughly saturating the soil when you water plants also helps the plants be efficient. If there is more water available, they will absorb more water, more quickly. You can also use a special sprinkler system, called “drip irrigation,” to water plants. Set it up on a timer to maximize its effectiveness. If you can help it, use cold water to irrigate. This is easier said than done in some settings. It can be especially challenging in arid climates. Choose a water source near your home, or from a natural well. If you can tap into a natural water source, like a spring or well, the water will also be more nutrient rich. Minerals found in good soil, like nitrogen and calcium, will be carried through the plants. A natural water source also saves you the cost of water purification. You don’t have to pay for every ounce of water you use! One way to do this is to collect used water in your house and save it. You can set up a rain barrel or tank. These are easy to hook up to your roof’s gutter system. Every time it rains, you get water for your garden, even while your garden is being watered! Setting up a rain barrel can save hundreds of gallons over the course of a growing season, especially if you grow thirsty plants like corn or watermelon. 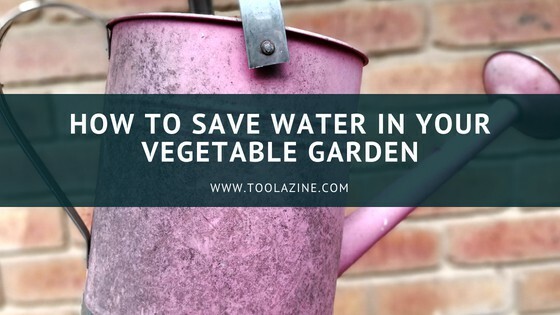 Water your garden with grey water that would otherwise go to waste. This can be as small or large scale as you like. Keep a bucket near your kitchen. You can pour in water that was used to cook pasta or boil eggs or even the washing up. You can also dump in leftover water from single-use bottles. Be creative! 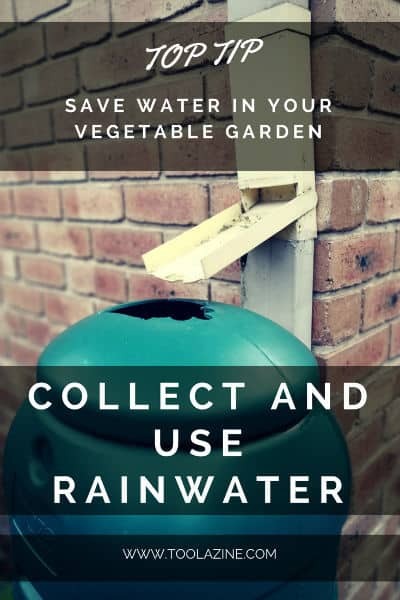 If you recycle water, just be careful not to save liquids that could be hazardous to your garden or to you if you eat vegetables from your garden. Soda, coffee and other sugary or acidic drinks can be great for certain plants (roses) and awful for others (peas). Be careful about what chemicals you are putting on your vegetables that you are then going to eat. Dishwashing soap is generally ok but other cleaning chemicals are best avoided. Plant your garden as closely together as possible. This might seem counter-intuitive. You don’t want to choke out plants, but you should avoid wasting space. Getting plants tightly together has an added bonus of cutting down on your weeding. If there are plants using the available root space and preventing much sun from reaching the soil, weeds will struggle to get started. This closeness also means water won’t be left in the soil to evaporate or run off. Instead, interwoven roots will drink up every last drop! You can often get more plants into a given space than seed packets recommend. This also means a greater quantity of flowers or produce, too. Some plants pair together extremely well. For instance, Native Americans have planted corn and squash vines together for centuries. Onions and lettuce or Swiss chard are another great pair. You can even match up root vegetables with vining plants. Some plants don’t do well together, so research before you pair. For instance, mixing tomatoes and vining plants doesn’t work well. Tomatoes need lots of water, and can steal it from the squash or beans. The vines can also strangle the relatively weak stems of the tomato plant. When you pair plants this way, you maximize use of root space and increase how much water is used. This means you have to water less. The plants also help keep each other cool, and prevent water loss due to heat. A final way to conserve water is to cover the earth of your garden. The easiest way is to use mulch. The wood chips should not get too close to the stems of the plants where they rise from the ground, though. This risks mold and mildew on your plants. You can also use the leaves of your co-planted vines, or plant ground cover species. These are more natural methods. However, they are also less effective than mulch because the additional plants require additional water. You can use woodchips to improve the condition of your soil. Compost is great for your soil because it adds organic matter and helps to retain water, especially in sandy soils. It also helps improve drainage in clay soils. You can make your own compost from household and garden waste and add it to your garden. See how to make compost. Choose pots and containers that help save water. Glazed terra cotta containers look great and don’t lose water through the pot sides. These types of pots use less water than those that seep water. Check your garden watering systems for leaks. Watering systems (hoses, sprinklers, drip irrigators etc.) can deteriorate over time. A leak can stop the water going to where it is needed. You should check your watering system at the start of each dry season. Saving water is good for your garden, your wallet and the environment. Choose the methods that are most effective for your gardening needs! Hi, I’m new in gardening, so I’m always down for a good advice. I’m thinking of the best way of watering a garden, more specific, of drip irrigation system. Are there more types of it and if, which one is the best?